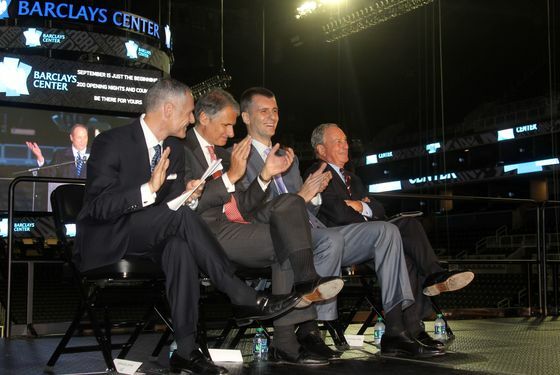 As you've probably heard, the ribbon cutting for Barclays Center happened this morning. The place isn't exactly open yet — that won't happen until a week from tonight with the first Jay-Z concert, though there will be some private events this week — but the whole gang, including Mayor Bloomberg, Mikhail Prokhorov, Bruce Ratner, Brett Yormark, Brook Lopez, and basically everybody but Jay-Z, was there to cut the ribbon. (We weren't; we're allergic to comically oversize scissors. Also, we had another assignment.) For a breakdown of pretty much everything from every angle, Nets Are Scorching has a terrific Storify thread that brings in every media tweet that escaped for public consumption, John Schuhmann has the official quotes, and our own Justin Davidson has a positive review of the building itself. Soon there will be actual games there. It begins.